As Tate Modern - the London gallery famed for its electic collection of modern art - turns five, a look at Britain's artistic taste suggests it has gone through a dramatic change. People's preferences have more to do with Ikea than what they find in galleries, according to research. Psychologist Dr Alison Kidd found popular taste in art has broken free of the established "great artists" and people are increasingly comfortable in choosing what they like rather than what experts believe is good. She says while the market for art has been growing, most people are not interested in famous names. Conversations with people looking for framed posters reveals that they seek out a particular colour and shape irrespective of who painted it. A popular trend at the moment is for "minimalist, blotchy, brown, chocolate canvasses". Others, she says, simply want something "for instance blue and stripey", a change from the past. "Stripey things were not what you hung in my parents day," Dr Kidd adds. But she says Britain's new enthusiasm for abstract paintings has more to do with the TV programme Changing Rooms than Tate Modern. Department store John Lewis now organises its art according to colour and mood rather than by artist. Indeed, it appears, the popularity of famous artists makes them less appealing because people want their homes to look individual and do not want the same picture as their neighbours. When talking to people, Alison Kidd found being "fresh" and "individual" was more important than fame or quality. Nevertheless some artists have kept their popularity. L S Lowry ebbs in and out of fashion but still holds a place in the public's imagination. 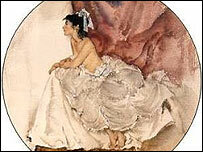 The slightly clothed Mediterranean ladies of Sir William Russell Flint are also big sellers. Mark Rothko's stark abstract images are beginning to slide down the popularity list after a high point around five years ago. And two of the top ten, Alan Ingham and John Miller, died recently. Both were landscape artists in very different styles. 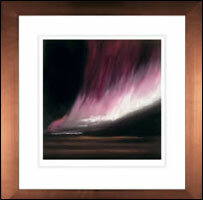 Indeed, although abstracts are increasingly appearing on people's walls, we still prefer landscapes. But those landscapes are themselves often fairly abstract. At one of Britain's biggest retailers of reproduction art, Ikea, sales of work printed on to canvas have been growing and one of the biggest sellers is a painting called Fragmented Harbour by David Briggs. Around 3,500 are sold each week. However, few people questioned knew the name of the painter. The vogue for Mark Rothko appears to have been driven by the bold colours on people's walls rather than an affection for the artist. Dr Kidd says it could be argued Ikea is more influential than Tate Modern on the British public. But few of Britain's most popular artists make it in to a public gallery or museum. Jack Vettriano has topped the list for several year. His painting The Singing Butler recently sold for £744,800. He earns around £500,000 each year from posters and other licensed images, but feels the art world looks down on him. He has yet to show his work in a major public gallery. 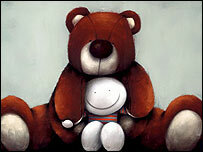 The most popular published British artist - winner of Fine Art Trade Guild's award - is Doug Hyde. Almost unknown two years ago, he has now become a major draw at galleries around Britain. At one event some people had queued for more than six hours to meet him. His sentimental and comic images of animals, hearts and moon-faced smiley people has a keen following amongst adults and children. They tend to provoke a smile which is not a reaction you see very often in museums. The art is very different from anything considered for the Turner Prize. But one of the leading art publishers in Britain says "you get nowhere selling Turner Prize winners". Britain may produce world-class "conceptual" art but we choose to hang something rather different on our walls.